Figure A88. 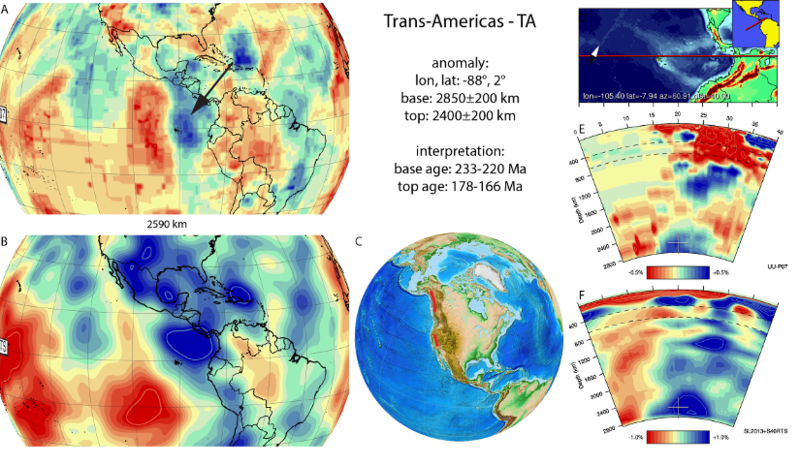 Trans-Americas anomaly, interpreted as the Trans-Americas slab, with (horizontal) [vertical] cross sections through (A)[D] the UUP07 p-wave) and (B)[D] the combined SL2013 and S40RTS s-wave models at 2590 km; C) the location of the modern geological record that we interpret to have formed during the subduction of the slab. The Trans-Americas anomaly (Figure A88) is located below the Cocos plate and Central America from the core-mantle boundary up to the deep mantle. It has been detected in previous seismological (Niu and Wen, 2001; Thomas, 2004; Hutko et al., 2006; Kito et al., 2007; 2008) and tomographic studies (van der Hilst et al., 2007, Ko et al. 2017). We infer by correlation to the base of the Cocos slab to the northeast and the base of the Idaho slab to the north that the Trans-Americas anomaly represents lithosphere that subducted during the Middle Mesozoic or before. Van der Meer et al. (2010) previously interpreted the Trans-Americas slab to result from subduction of Farallon/Panthalassa lithosphere in the Permian to Triassic associated with the Sonoma orogeny at the western margin of Laurentia (Ziegler, 1989; Ward, 1995; Cawood and Buchan, 2007). Alternatively, and perhaps more likely, the slab may have an early Mesozoic intra-oceanic origin with its associated arc accreting to the western North American margin during the Middle Mesozoic. The Stikinia-Quesnellia arc may fit such a scenario. This arc initiated in the Middle-Late Triassic and accreted to Laurentia in the Early-Middle Jurassic (Nokleberg et al., 2000; Johnston and Borel, 2007). However, the location of the Stikinia-Quesnellia terrane, currently extending over 1200 km (Nokleberg et al. 2012), is poorly constrained and may in fact represent more intra-oceanic arcs of varying ages and paleo-locations. As pointed out by Shephard et al. (2013), other slabs (e.g., Wichita, Hudson), would have been correlated as well with this arc. Alternatively, Boschman and van Hinsbergen (2016) suggested that the Trans-Americas slab may have detached as a result of triple junction migration at the Izanagi-Farallon plate boundary, which culminated through instable triple junction formation in the 190 Ma birth of the Pacific plate. Further research on this topic may require us to revise the age of the slab, which we now tentatively place between 233 and 166 Ma covering the age of Stikinia-Quesnellia subduction (see Wichita slab) as well as the birth of the Pacific plate.